Suzanne Bouffard is a writer with a passion for making social science research accessible to the general public. Her writing has appeared in The New York Times, Parents, the Harvard Education Letter, and other outlets, and she is the winner of a 2013 Solutions Journalism Network grant. She holds a Ph.D. in psychology from Duke University. Think the glass ceiling in science, technology, engineering, and math (STEM) careers has been shattered? Think again, say researchers Nilanjana Dasgupta and Jane Stout. Even though women outnumber men on college campuses, STEM courses have three men for every woman, and the trend continues once students enter the workforce. Under-representation of women in STEM careers is a serious problem, and not just for females. STEM businesses are an increasing driver of the U.S. economy, and they are turning to international talent because of an undersupply of qualified domestic workers. Encouraging more American women to enter STEM careers could do much to fill the gap, Dasgupta and Stout point out in a recent paper for the journal Policy Insights from the Behavioral and Brain Sciences. 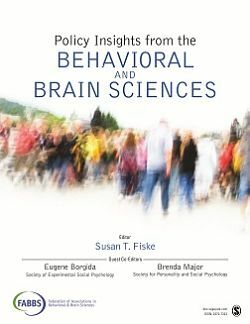 The Federation of Associations in Behavioral and Brain Sciences, or FABBS, with SAGE, the parent of Social Science Space, publishes the journal Policy Insights from the Behavioral and Brain Sciences. This annual journal features research findings in the sciences of mind, brain, and behavior that are applicable to nearly every area of public policy. The first issue comprises 33 articles in social and personality psychology focused on topics including health, education, justice, the environment, and inequality. There is a “leaky pipeline” in STEM, according to the research Dasgupta and Stout reviewed: women gravitate away from science, technology, engineering, and math at multiple stages from childhood through mid-career. That means simply exposing young girls to STEM careers – an oft-proposed solution to the problem – is not enough. Remedies need to be introduced from childhood through adulthood and based on research about the most common barriers women encounter. 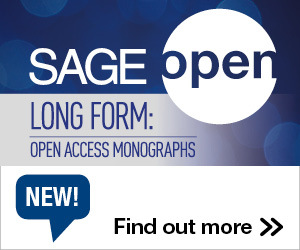 The strategies the authors propose focus on removing and overcoming structural barriers, because too often “women deal with professional barriers as individuals, handling them on an ad hoc basis,” write Dasgupta and Stout. During childhood and adolescence, girls internalize stereotypes from parents, peers, and the overall culture that STEM courses and careers are for boys. It is telling that boys are more interested in STEM activities than girls by age 10, well before performance differences emerge, because the pattern suggests that interests drive the performance differences, not the other way around. Studies show that girls tend to value communal goals like collaboration, altruism, and social problems, and they often don’t see the many ways that STEM careers can target these goals. Expose girls to more female role models through museums, after school programs, and summer camps. When women do enter college on a STEM track, they often report feeling that they don’t belong. Not only are they outnumbered by their male peers, they encounter few female professors and mentors. But when these patterns are intentionally overturned, women feel more confident and are more likely to pursue STEM careers. One study found that female college students were more self-assured and involved on project teams composed of 75 percent women than teams composed of 25 percent women, and another showed that women who took a calculus course taught by female faculty were more confident and more likely to declare their intent to pursue a STEM career. 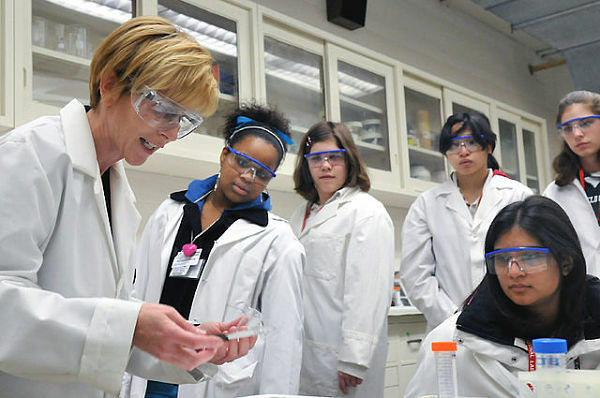 Even after women have embarked on STEM careers, new barriers emerge, including bias in hiring. One study compared what happened when university faculty evaluated two fictional job candidates with identical resumes but different genders. Male candidates were rated as “more competent and hirable, more worthy of mentoring, and deserving a higher salary” than female candidates. Another study found that faculty wrote more substantive recommendation letters for male candidates than for female candidates, stressing men’s skills and accomplishments versus women’s personal attributes. Studies show that women are also more likely to face a hostile work environment and to report struggles with work-family balance as a reason for leaving STEM careers than men. Stopping the “tenure clock” for a year when women have a child or other caregiving responsibilities. All of these solutions to repairing the “leaky pipeline” are a shared responsibility among many individuals and institutions, including elementary and secondary schools, universities, museums, and STEM industries, say Dasgupta and Stout. Each has a role to play in helping women to anticipate and navigate some of the barriers, but far more importantly, in dismantling the barriers piece by piece. This entry was posted in PIBBS, Public Policy, Research and tagged Gender Gap, STEM. Bookmark the permalink. Post a comment or leave a trackback: Trackback URL.